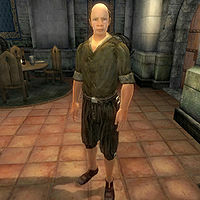 Styrbjorn is a Nord who hangs out at The All-Saints Inn in the Imperial City's Temple District. He is a Mythic Dawn assassin who only appears at the end of the Dagon Shrine quest together with Marguerite Diel, with orders to find and kill the player. He vanishes (together with Marguerite) at the end of the Light the Dragonfires quest when the Oblivion Crisis is resolved. The only thing he will say is to angrily announce that "I have nothing to say to you." Styrbjorn wears a set of lower class clothing: a collared shirt, breeches and a pair of rough leather shoes. He also carries a small amount of gold. Styrbjorn knows how to cast the standard Mythic Dawn Armor and Mace spell. Esta página foi modificada pela última vez à(s) 16h36min de 29 de maio de 2013.